In the journey towards success, there are an innumerable amount of factors that contributes as a driving fuel. Starting from the step one to the last everything is of great importance. Be it a student, businessperson or a blogger, keeping in mind all aspects is necessary. In blogging, there are a few such milestones like creating a quality content, getting up to 1,000 readers, attracting almost 1,000 visitors on a regular basis, and lastly grabbing a sum of the 10,000-email subscriber. Some blogs hit a jackpot within a few the first few days itself and some go by the speed of the snail. This is simply because of those dedicated set of people who always turn back to the blog after every post. Some bloggers fail to understand the value of these people and lose the chance of gaining possible viewers. Viewers are the reason blogs exist thus, let us see few effective ways to get more readers to your blog. Without a full strategy, blogging is simply of no use. Blogging blindly without a proper planning may hamper the speed of success. The strategy makes it possible to give a laser-focus on the target that you wish to achieve in the short as well as long-term. At the same time, a goal of what is the exact target should also be decided. For example, if you target more readers as your goal than you need to make a strategy focusing on it. Bribes are legal when it comes to grabbing a handful of loyal readers. With the advent of technology, it has become easier to bribe readers with a worthwhile return gift. Worth reading free e-books are the best way to allure the readers into your blogs. It is an easier and inexpensive option so there is no harm in trying. Networking is a very often-used word in the e-world. Even after that, many bloggers seem to overlook it. Networking is a very simple method and it takes hardly a few minutes to start. Of course, that does not mean that you have to copy-paste your blog link into someone else’s comment box. As a fact, it is actually rude to do so. You can initially do some favors to others, form a friendly bond, and later turn that friendship into your favor. Facts do count no matter what the topic is. Good research is the soul of good content and thus, it is equally important to take enough time to collect significant data and keywords. Research contributes to the rank of the post and gives a promising response from the viewers. Hence, research is necessary. Authors, writers and bloggers deeply hate plagiarism. Even the viewers look out for variety thus, it is a necessity to be distinct, different and diverse in producing a good and unique content. Highlight the difference, grab the interest of your viewers, and turn them into your dedicated readers or subscribers. 6. Things do not work equally for all! With the vast opportunities and platform, many bloggers have opted for various techniques or strategies that begged them success. However, borrowing those measures directly may not benefit you the way it did to them. Thus, it is your queue to test various ideas. This will help in opting for the one that works wonders for you. It gets easier when your readers make an initiative and promote your work. However, how will that happen? That will happen only when you will create user-friendly and easier sharing option. The best way to extend the web of your network is by simply adding easily access able social sharing buttons. Many a time people refrain from giving away their personal email Ids. Anyone surfing online would feel suspicious enough about the safety of his or her Ids. After all, cybercrime is not a foreign term anymore. Thus, when people visit the blogs they are unsure of providing their mail Ids, as they have no such idea of the mailing list and e-mail subscriptions. So, whenever it is possible one must explain but in a simpler manner. Strategies for any business experiences change according to the time. Adapting and evolving according to time is a factor that is required. Whether it is a long time or a short time goal improvising strategies is very important. Similarly, when it comes to blogging targets implementing new strategies is definitely called for. For example, if you desire a good number of subscriptions to your masterpiece then start with a few mini or short-term work and push it enough to gain the ultimate target. Completion of goals does not mean that it is time to sell your website or blog. After reaching a certain limit of readers and hitting the milestone, the idea of selling becomes tempting enough. Nevertheless, there are times when you feel guilty of leaving or selling it too early. You may have gotten lucky enough if you had not sold it too early. 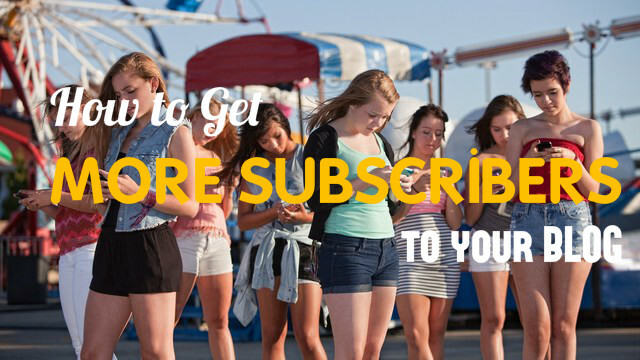 A couple of subscribers might have begged more money if you had waited a bit more. After all, patience is a virtue, and it always brings good results. So, wait up more and grab a good price for your success. 11. I am calling you, yes you! A Homepage header is the first thing viewers look. Although one should never judge a book by its cover, but it seems like we always do judge it by its cover. Similarly, the header is what grabs the attention of the reader. A good header is the one that reflects the mood and content of the blog. It should be determined according to the targeted audience. It takes a good few minutes to create a header, but it is a promising factor. Best examples of such headers are Harmony Republic, Cosmic Diary, Nerd Fitness, etc. Some users prefer PC whereas some simply opt for mobile phones. Because of opting for phone, it is possible to get more views and subscribers. Here is when themes matter a lot. Of course, not everyone can afford a user-friendly theme, which is responsive as well. However, the least expected thing is that bloggers make sure to opt for forms and popups that also support mobile phones. For example, if the theme is not user-friendly for mobile users and they face trouble accessing it then they might exit without having a look at your content. Some studies prove that every extra second that it takes to load a page you lose many possible readers. Varieties of choices make thing more appealing. The more segments you have the more is the possibility of increasing readers. Not everyone is interested in all the topics (unless you have only one main topic). Thus, create multiple landing pages that ask for subscription on various topics. For example, if your posts are of diverse topics but the subscriber is only interested in parenting topics than he or she should be able to subscribe only those topics. This method offers a selective traffic and gives you clear stats of people’s satisfaction. Put yourself in the subscriber’s shoes! By putting yourself in the subscriber’s place is the best way to understand how important it is to be true to your words. In simple words, be consistent with updates. If you promise a ‘once a week‘ update then do not send them updates twice or thrice a week. That will prove to be one of the reasons you lose your people. Referring to the last point one can simply say that inconsistency with the posting can lead to ‘spam’. There may be an abundance amount of email subscriber but it is simply a waste, as they do not anymore feel interested into the content. It is due to the irritating posts every once in a while, labeling them as spam makes them feel better. Of course, no one likes spam. Gaining and losing is a constant and natural thing. Similarly, losing subscribers is not something you should be worried about a lot. As a fact, it is a good thing. If you have a list of 30-40 people, who have unsubscribed your blog means that you are getting rid of the people who have no such interest in your blogs or content. Undoubtedly, the number of subscriber decreases but at the same time, you get true stats of the people interested. One of the coolest ways to increase the number of readers is by using a simple plugin called WWSGD. What is WWSGD? It stands for What Would Seth Godin Do. This plugin includes a dialogue box, which appears at the top of your post. This dialogue box appears to the new visitors. It flashes the subscribing option. After a visitor visit, five times the message disappears. It has a customizable feature which changes the setting accordingly. For example, if they come from any other source i.e. Twitter, Facebook, etc they will receive a message like “Hey there! Check out to get the most out of time”. These types of plugins make it easier to get more subscribers. The best way to experiment anything is by trying yourself first. Then later making your friends try it. ‘The best day to post’ is a question that has various answers to it. The majority of the people have had a debate over the best day for blogging, where some voted for Mondays and some for Sundays. Determining your own best day is advisable; after all, it is all about try and errs. The best day can be any day of the week but what determines that is how much more traffic or how much more response did you get on the post. Generally, the best traffic is around 9 am to 11 am East Standard Time(EST). Keeping in mind, the best traffic time is the best way to start blogging. This helps in gaining more traffic and add ups the chance of more interaction. If during that time in your country it is 3 am – 4 am at night then switching onto automatic scheduler will be a lot easier. Although that might reduce the chances of replying through the comments section as it would not be instant. Of course, the choice depends on priority. One of the best ways to grab or increase at least 7% of readers is by simply redirecting. Redirecting comments by a simple plugin to a thank your page attracts subscriber more. Although this redirecting may only show to first time viewer, it is effective. Whenever someone drops a comment on the blog for the first time, it will redirect he/she to another page that will thank him or her for the interaction and show some other interesting content relating to different topic or content. Lastly being genuine is one of the most important things. If you feel that you are good at faking a genuine behavior go for it, but if you are not then your readers will feel the fakeness from the words. After all, words are the most powerful thing in human history. People always search for a genuine and frank thing online thus; offering them what they are looking for through a quality content is the best way to boost the readers or subscribers. To expand a blog towards a full-blown success, it is important to expand subscribers through the mailing list. Further, there is always a scope for a better version thus; one should continuously strive for betterment with new techniques and strategies.